Hello, and welcome to my blog and my kitchen! I’m not a professionally trained chef, nor have I ever worked in a kitchen. I just love cooking for myself, my family, my friends, and anyone who ends up sitting at my table. Everything on this blog comes from a cookbook on my shelf, a friend’s shelf, online, or it’s something someone spewed out at a party when they heard I have a food blog. and are brave and awesome enough to share something with me. Where I can I give credit, but it’s not always easy when it’s something someone found somewhere online ages ago and tweaked to fit their own kitchen and passed to someone else who tweaked it again and then passed it onto me. I like to think my cooking style is fairly average – I don’t cook with a lot of flair, but I do cook with a lot of flavour! I tend to lean towards more ethnic foods, as I find they are packed with taste. I prefer recipes that can be set on the table within the hour, complete start to finish. Occasionally on weekends I will try my hand at more complex recipes, but even then I find it’s a lot of work. Outside of cooking I also love handwork (knitting, crochet, etc), reading, and writing. I have two dogs, a wonderful partner (who has a dairy-allergy, hence all the dairy-friendly modifications you’ll find! ), and a beautiful new kitchen in our beautiful new house. If you have anything to share, a new recipe or some thoughts on an existing recipe, please feel free to comment on the appropriate post, shoot an email to me at talesfromakitchen@gmail.com, or find me on Twitter @kitchentales. 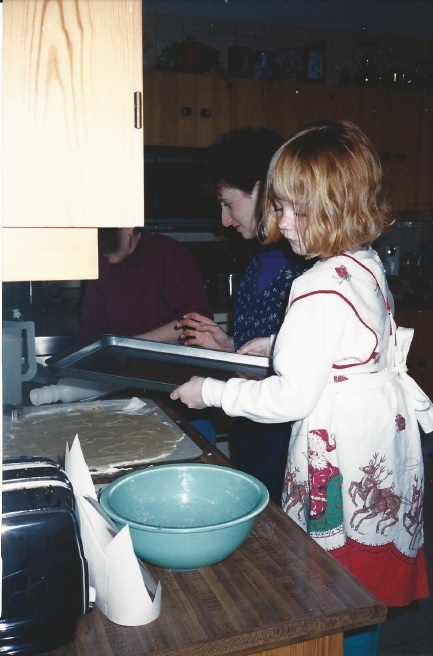 Me at a very young age baking Christmas cookies. We really like Cactus Club Blackened Chicken as well, so I tried your recipe and it was great, creole was awesome. Thanks for sharing!